Q: I am only available to umpire certain days of the week. Is the umpire scheduling flexible? A: Yes. Many of our umpires play on sports teams themselves, or have other commitments on different days of the week. Our Umpire-In-Chief works hard to ensure that all umpires are assigned as many games as they are available for. However, if should be noted that the more games one umpires, the more skilled they will become. Q: What is the umpire uniform and do I need to provide my own? A: The umpire uniform consists of an umpire shirt, grey umpire pants, black shoes, and an umpire’s hat. 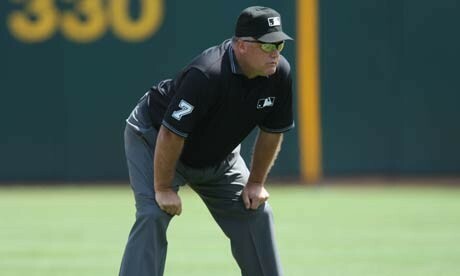 The OBA mandates that all umpires wear the approved umpire shirt, hat, grey pants and black shoes. In the event of colder or rainy weather, it is recommended that a navy or black plain pullover be worn. NOTHING with logos or detail is allowed. Umpire pullovers are available through Silverstar Sports if interested. The gray pants can be purchased from almost any clothing store and are fairly inexpensive. A black or navy belt is also mandatory, as the umpire ball bag needs to be attached this way. Umpires are expected to be wearing this uniform EACH time they step on the field, with no exceptions. Q: How are umpires ranked in the AKBA? A: OBA umpires are ranked according to Baseball Ontario’s policy regarding umpire certification. Our Association is home to umpires ranging from Level 1 (beginner) to Level 4. The majority of our umpires fall into the Level 1,2, and 3 categories. The higher the level of an umpire, the more advance games they are eligible to officiate. Q: What kind of equipment does an umpire wear? A: Umpires will need to use a set of shin pads, an umpire mask, as well as a chest protector. The AKBA provides these for purchase, please contact Jim Wagg should you need further information. Ensure that you bring them to each assigned game even though you may not be doing the plate. A: While baseball is a highly competitive game, there are rules in place in order to keep arguments at a minimum, as well as to protect the umpires. One thing to remember: always remain confident with your call; in baseball there are two team, and on EACH pitch or play, one of the teams is not going to be happy with the outcome. If there is are problems, you are always encouraged to contact the Umpire-In-Chief and we will ensure that the situation is looked into. Q: What is the pay rate? A: The pay rate for umpires in the Aurora King Baseball Association depends on the age level you Umpire. The AKBA uses umpires to officiate all games between the Rookie Ball and the Junior age group, at the house league, select, and Rep levels. The higher the age level the higher the pay rate will be. All beginning umpires should expect to begin by umpiring Junior Rookie Ball and Mosquito house league games only until they have gained experience in these groups.